Late in l997, Dr. Sendax collaborated about his mini implant theory and design concepts with a colleague, Dr. Ronald A. Bulard. Dr. Bulard had previously formed a dental implant company, IMTEC Corporation, which was at the time manufacturing and marketing standard sized dental implants, abutments, and other dental products. Convinced they were on to something special, the two implantologists spent countless hours studying and refining Dr. Sendax's original creative design, resulting in a more efficient top and collar to the mini dental implants. Combining this now re-designed mini implant with Dr. Sendax's original insertion protocol resulted in a successful breakthrough. Under Dr. Bulard's direction, IMTEC Corporation began the rather complex and expensive design and manufacturing procedures which ultimately resulted in what is now offered to the dental community under the brand name IMTEC Sendax M D I (mini dental implant). The innovative system and procedure was thereafter formally introduced to the United States dental community at an implant conference in Orlando, Florida in April, l999. It was an instant success and now represents one of the fastest growing segments of the dental product industry. When can Mini Dental Implants be used? What's the primary and most effective use for Mini Dental Implants? I'm somewhat aware of the tremendous forces the human jaw usually endures during normal chewing of food. How can these tiny Mini Dental Implants withstand that? It's true that what the dental profession calls occlusal forces create dynamic pressures on the human jaw. Our jaws are marvelously designed to adequately withstand those forces. It's also true that mankind has been struggling for centuries to come up with some type of metal or metallic element that can efficiently withstand those forces. Most have been outright failures. However, approximately twenty-five years ago some doctors around the world began experimenting with titanium as a potential dental medium. Titanium is an extremely strong metal used in the construction of aircraft and aircraft engines. The metal, in its commercial form, is incredibly strong and durable. The Sendax Mini Dental Implants takes that metallurgical concept to the next level by adapting an industry approved alloy of titanium. The result is the strongest metal on earth, now commonly referred to as titanium alloy. In fact, extensive tests conducted several years ago by the University of Alabama-Birmingham School of Orthopedics at Dr. Sendax's behest revealed that the particular titanium alloy implants used in the IMTEC Sendax Mini Dental Implants are 64% stronger than ones constructed of commercially pure titanium. 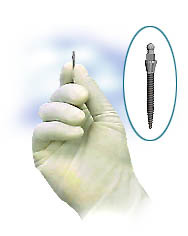 The bottom line of this discussion area is simple: If a denture patient has sufficient bone mass to create a rock hard placement of the tiny implant, which an experienced dentist can usually determine by an initial examination, the mini dental implants will generally withstand normal chewing forces just like natural teeth. Fractures are extremely rare, but as the case with a person's normal teeth, can certainly occur. You've told us about the diameter of the Mini Dental Implants. How long are they? IMTEC Corporation manufactures and sells the Mini Dental Implants in four lengths, l0, l3, l5 & l8 mm's. One trained in dental science will recognize instantly that these lengths appropriately anticipate the type of depths that are needed in a wide variety of prospective Mini Dental Implant patients. The company also manufactures what it calls the Mini Dental Implant MAX that's sold in l0, l3 & l5 mm's. The use of the MAX is explained in the next question.